Dr. Gaikwad has immense experience as a Head and surgical Oncologist in treating all types of Cancer patients in leading centers in Gurgaon. As a Professor of Medical Oncology, he specializes in Advanced Minimal Access Surgery and HIPEC. He also has expertise in Pancreatic and Liver Cancer Surgery, Laparoscopic Colorectal, and Upper GI Cancer Surgery and Neuroendocrine Tumours, to list a few. He has undergone specialized training in Advanced Minimally Invasive Upper GI Surgery, IRCAD at Taiwan. He has over 20 years of experience of satisfied patients in his field. He has also gone through a dedicated Certified 2 year fellowship in GI and HPB Oncology, Tata Memorial Hospital, Mumbai. Over the years he has successfully handled numerous complex cancer surgery cases. 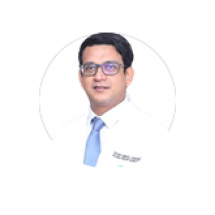 Dr. Vinay Samuel Gaikwad has published several papers in India and abroad and is a member of prestigious medical associations. He believes in promoting health awareness and following a healthy lifestyle. Dr. Gaikwad has been honored as an Invited faculty with a lecture on pancreatic NETs ASICON 2015.